SAN LUIS OBISPO, Calif., Sept. 29 – In August of 1971, Deputy District Attorney Vincent Bugliosi asked former family member Brooks Poston to explain the relationship between Bruce Davis and Charles Manson. “It seemed to me that Bruce was competing with Charlie,” said Poston. “He was trying to be an equal with Charlie or even he — he was loud-mouthed. “You got the impression that Bruce Davis wasn’t subservient to Charlie either?” questioned Bugliosi. This is the kind of portrayal that Bruce Davis and his attorney, Michael Beckman, will try to distance themselves from Thursday, when Davis appears before the California Board of Parole Hearings for the 27th time. Much of the debate at Davis’ prior parole hearings, has centered around his role in the family. Los Angeles County Deputy District Attorney Patrick Sequeira has presented Davis as a leader within the group, while Beckman has maintained there is nothing to support it. Davis, serving a life term for the murders of Gary Hinman and Donald “Shorty” Shea, was recommended for parole in 2010, but was later denied by then-governor Arnold Schwarzenegger. In July of 1969, Davis drove Bobby Beausoleil, Susan Atkins, and Mary Brunner to Gary Hinman’s Topanga Canyon home with the intentions of getting money from Hinman. “Bruce drove and just dropped us off,” said Mary Brunner. “We decided that Sadie and I would go to the house and if Gary was there alone, we’d signal at the window. We were going to ask Gary for some money — for $3,000 or $30,000 — I’m not sure how much. The three held Hinman hostage for the weekend. Sometime during the conflict, Hinman managed to take possession of the gun. A call was made to Spahn Ranch, but by the time Charles Manson and Bruce Davis arrived to Hinman’s, Beausoleil had already gotten the gun back from Gary. Manson slashed Hinman across the face with a sword, cutting his left ear and cheek. Davis took back his .9mm and left with Manson in Gary Hinman’s Fiat. Finally on Sunday evening, after Hinman signed over the pink slips to his two cars, Beausoleil stabbed him twice in the heart. Beausoleil, Atkins and Brunner took turns smothering Hinman with a pillow case before hotwiring his Volkswagen and returning to Spahn’s Ranch. A month later, late in August of 1969, Manson told Davis they were going to kill Donald “Shorty” Shea. “I was standing there. I couldn’t even get away. We were all just right there together,” said Davis. “I said, okay, here we go. I got in the back seat opposite him, Grogan was on my left, Watson was in front of me. Mr. Shea was driving. “Watson tells him pull over. He hesitates. Watson stabs him. He pulls the car over. Grogan hits him in the head. “I knew in the Hinman case that I was on — it was bad. I knew that. But you know, I had deceived myself into thinking that if I don’t — if I didn’t shoot Gary, if I don’t beat him up, that I’m okay. “Manson pulled up in the car behind me. He came by and said let’s go. So I went. So I’m down there. They had already been stabbing him. He had a bigger knife. He handed me the machete. “And he put the knife in my hand and said you better do something. Well, I know, I got the message. “I reached out and I cut [Shea] right across the shoulder. I cut him with this knife. Boy this knife was sharp. It laid him open. I don’t know if he was dead or not. Prior to Davis’ 2010 hearing, he had been given 23 consecutive one year denials. In 2006, he received a split decision and was later denied after an En Banc hearing in November of that year. Davis’ hearing, originally scheduled for this past June, was postponed after Davis became ill shortly before its start. It was to be Davis’ first parole hearing with victims representatives in attendance. Debra Tate, sister of Sharon Tate, had planned to make a victim’s impact speech for the Hinman family. While former Manson family Barbara Hoyt, came to speak on behalf of the Shea family. Hoyt has opposed Davis’ release for years and testified at the En Banc hearing after Davis’ split-decision in 2006 . “The public needs to know this man is very dangerous now as he was in 1969,” Tate told CNN in June. Davis has been incarcerated since April 21, 1972. Since that time, Bruce has been active in many self-help and spiritual groups within the prison. His prison disciplinary record is near spotless, with only 2 rules violations in over 40 years, last one occurring over three decades ago. In August of 2007, retired Superior Court Judge William Clark, wrote the board of parole hearings saying that “further incarceration beyond the 36 years served constitutes a miscarriage of justice,” and that Davis should be released. Davis’ many support letters, from both inside and out of the prison walls, show the positive impact he has made during his incarceration. In 2010, Davis’ attorney read a support letter from an inmate named Richard Kelly. Kelly wrote that he had planned to murder another inmate, but had a change of heart after conversation with Davis. 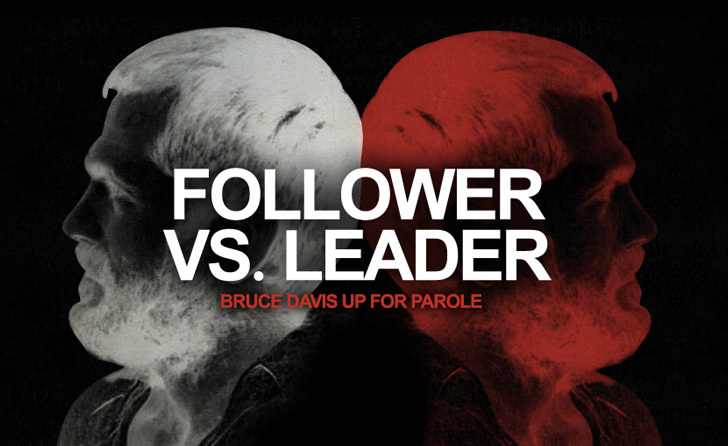 Which Bruce Davis will Thursday’s parole board see? The model prisoner and former follower that was reluctant to kill? Or the one time aspiring leader of a band of murderers? There remains the massive stigma attached to those once associated with Charles Manson. There is still much speculation that there were other Manson family murders. There may not be solid evidence, but the court of public opinion needs little to convict. Not mentioned in the article was Davis’ possible involvement with the shooting death of Zero aka John Philip Haught in 1969. I’m guessing it is still officially a suicide but there are some deep questions as to the legitimacy of that and whether Davis was perhaps responsible for the killing.